Book Club - The Matchless Gift ~ The Toronto Hare Krishna Temple! 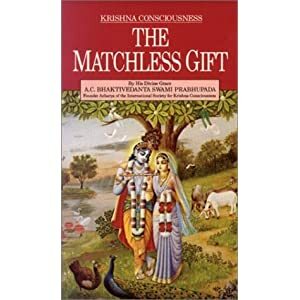 The Toronto Hare Krishna Book Club continues with a new book for February - "The Matchless Gift". It consists of only 98 pages so if you read 3-4 pages a day you can complete the book in a month! Living entities are originally pure in spirit, but by living in the world we are affected by materialism, burdening ourselves for temporary happiness. The aim of this book is to awaken this original, God-like condition and to facilitate the understanding of our eternal relationship with God. The objective of the book club is to facilitate and encourage readings from the wonderful philosophy of Krishna consciousness. We encourage you to participate! We will be sending out daily quotes from the book to those who register. To register for the book club, email toronto.sankirtan@gmail.com. Happy reading!